Application include pumps & valves, mechanical seals, hydraulic & pneumatics cylinder, filter, actuators, motors, engine, lubricating System etc. Oil Seal: This is a very common type of seal. It is used to retain oil and other lubricants in rotary applications and prevent leaks. Many of these seals function with a flexible lip that rub against the shaft or housing to prevent leakage by providing a tight seal. Mechanical Seal: This seal is used in applications that have a rotating shaft under a state of high temperature, pressure and speed. The mechanical seals are used to prohibit fluid leakage for mechanisms such as pumps, mixers, agitators and cryogenic seals. Rubber O-Ring: This belongs to a class o-rings that are made from a synthetic rubber-like material called an elastomer. This is a sealing ring that has a circular cross section which can be either hollow or solid. The seal can be used as a secondary seal for many mechanical seals. Balanced Seal: These seals are used to reduce the effects of hydraulic pressure in the seal compartment. Bellows Seal: It is used as a formed or welded bellows which supply a secondary sealing and spring loading. Bidirectional pressure Seal: This type of seal uniformly seal as a result of pressure from both directions. It is also known as "double balanced seal" or "reversible balanced seal." Dynamic Seal: This seal is used to stop leakage past components, when the components are in relative motion. Lip Seal: This is considered to be a versatile and high-performance seal which is used for uniform, low-pressure sealing. 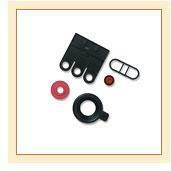 Rubber Piston Seal: Rubber piston seals are used for better grip, with specified engravings. Rubber Hydraulic Seal: Hydraulic seals are exposed to hydraulic fluids and are designed for high-pressure dynamic applications. Rubber U Seal: U-Seal, an integral part of hydraulic and pneumatic systems, have a symmetrical lip profile with chamfered sealing edges. Rubber V Seal: This is a type of axial seal for shafts and bearings, which seal axially against a counterface. V seals are very reliable and effective against dust, water and oil splash and other media. Wiper Seal: The wiper seal is used to prevent the ingress of dirt, dust and other foreign bodies, therefore extending the working life of the rubber seal it is protecting.